Are you a business leader who is: • Increasingly dissatisfied with scheduled airline travel? • Required to visit many facilities/customers/prospects in a short time span? • Interested in using bizav, and don’t know the right questions to ask? • Curious to know “can we afford business aviation travel”? • Currently using charter or jet card, and considering other options? If so, this webinar is for you! After attending this webinar, you will be able to: • Explain why 70,000+ worldwide enjoy bizav's compelling benefits. • Analyze your own travel requirements to determine if bizav is right for you. • Describe business aviation's various portals, and types of aircraft available. • Know what questions to ask to help ensure your safety. • Find out how and where to get more information without obligation. 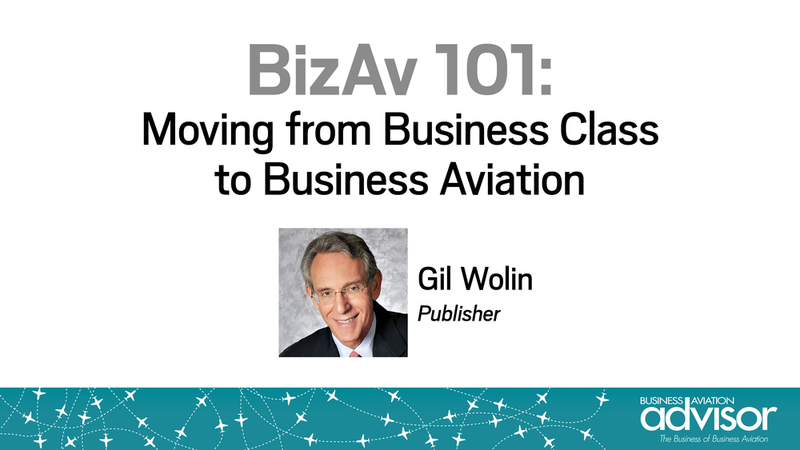 Gil Wolin grew up in and around aircraft, the middle of three generations of aviation professionals. He led sales and marketing at Executive Jet Aviation (today known as Netjets) before joining the nationwide FBO chain Combs Gates/AMR Combs as Vice President, Marketing. After a successful term as president of Denver-based charter/management company Mayo Aviation, Mr. Wolin was publisher of McGraw-Hill’s Business & Commercial Aviation, A/C Flyer, and ShowNews magazines. He subsequently joined TAG Aviation USA as VP Corporate Communications and Client Responsible Officer. An independent aviation consultant and frequent speaker at national and regional events, Mr. Wolin is a member of the National Business Aviation Association, and Business Aviation Professionals of New England. He is a past director of the National Air Transportation Association, and a past member of the Corporate Angel Network Advisory Board. Active in the business aviation market since 1993, Raymond Ringston is President and owner of Ringston Media, Franklin Square, New York. Ringston Media provides print and web design services for several FBOs, maintenance, charter, and other aviation-related companies around the country, and has provided creative direction and production for many industry publications, including McGraw-Hill's Business and Commercial Aviation magazine, AviationWeek's ShowNews, Metropolitan Airport News. Mr. Ringston stays abreast of business aviation news and trends by working closely with aviation writers, photographers, and other experts, and has participated in most major industry trade shows including the Singapore Air Show, Farnborough International Airshow, Paris Air Show, as well as those sponsored by the National Business Aviation Association, Helicopter Association International, and the Malaysian Aerospace Council. While business aviation is its niche market, Ringston Media also works with Fortune 500 companies such as Unilever, Pepsi, TDK Electronics, Nestlé, Samsung, among many others, and publishes several non-aviation magazines each year. An active member of the Long Island Business Aviation Association, Mr. Ringston donates his time and talent to this and other business aviation-related nonprofit and trade associations, as well as to many non-aviation charitable organizations. Want to learn more about your investment in business aviation? Business Aviation Advisor’s exciting new webinar series, on the business of owning and flying business aircraft, presents the information you need: from entry portals, to acquisition and operations, to management, insurance, and finance – and more. • Increasingly dissatisfied with scheduled airline travel? • Required to visit many facilities/customers/prospects in a short time span? • Interested in using bizav, and don’t know the right questions to ask? • Curious to know “can we afford business aviation travel”? • Currently using charter or jet card, and considering other options? • Explain why 70,000+ worldwide enjoy bizav's compelling benefits. • Analyze your own travel requirements to determine if bizav is right for you. • Describe business aviation's various portals, and types of aircraft available. • Know what questions to ask to help ensure your safety. • Find out how and where to get more information without obligation. Business Aviation Advisor magazine webinar series, the information you need, from the aviation experts you can trust.